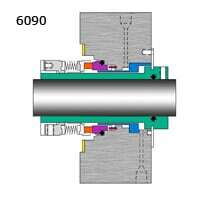 The type 6090 seal is a heat treated high temperature rotating metal bellows design. It is available as either a component seal or a cartridge mounted assembly. It has the same inherent features as our other metal bellows seals. Face materials of carbon, silicon carbide, and tungsten carbide. Elastomers: Fluoroelastomer, Perfluoroelastomer, Aflas, EPR/EPDM as standard o-ring materials. All other commercially available elastomers as specified. Type 6090 utilizes Graphoil secondary seals for high temperature applications. Sizes: Up to 5.00”. Available in both inch and metric sizes.